In an attempt to get rid of the holiday fat by means of, among other things, our favorite fitness class, vi are a couple of Birkerød Ninjas who have set ourselves the task of taking 13 BodyCombat classes in 13 days, from Thursday 29/7/2015 until and including Monday 10/8/15. To make it a bit more interesting, we intend to collect data such as calories burned and weight loss in addition to reviews of the centers we visit and our subjective opinions on the playlists. We will intentionally not comment on the instructors, neither positively nor negatively. Not all 3 of us have been able to attend all 13 classes. Playlist: Release 64 with substituion of Track 2 and Track 4..
Karin had to start before the rest of the troupe, as Jackie & Ivar had a football game to watch! Ivar: Really nice with 3 tracks from 21, which after all is 11 years ago. Jackie: I sympathise with the 3 first-timers; it was a tough choreography! Review of center: Nicely located center. Out of the metro, to the left, and the center is at the middle of the square in the same building as the gourmet burger place, Halifax. Reception and relaxation area is a ground-floor level. Fitness and studio at -1 and changing rooms at -2. Positive: Quite a cool very wide and not so deep studio. Makes for a potential long front row. The showers are button operated instead of irritating motion sensors and there are even water temperature regulators. Negative: Studio entrance is surrounded by fitness machines – it’s nigh impossible to wait outside for the class without getting in someones way. Playlist: The 64 this time had 5 tracks replaced, but unfortunately not Track 4. This was partly made up for, by a pleasant appearance of track 8 from release 44 (Your Shining). Ivar: It was great fun trying a new center and an instructor I haven’t come accross before. The class was not particularly vocal. As Jackie had work commitments and Karin had some restitution for her knee, it was Ivar’s turn to go it along, but Tina surprised us by taking a class from the floor rather than the stage, for a change, so Birkerød was well represented. Playlist: Yet another 64-based playlist, though both track 4 and 5 were substituted – yeah! – and a pleasant revisit by Turbulence. Ivar: I got out of bed too late for breakfast and the attempt at taking the class on an empty stomach failed spectacularly. I completely ran out of power after Muay Tai. I can feel this is the 3rd class in a row for me. I have gone to 87.5kg losing 2.5, but the first kilos are always the easiest for me. Karin: Very tough program; I nearly puked! Jackie: I skipped track 9 to see if it would improve my lower back, which have started to bother me..
Review of center: Another well located center, right next to the Herlev Shopping Mall, where we chose to park. The whole gym is in one level. There are coded lockers rather than card operated and showers are push-button operated. The studio capacity is 40 participants. Playlist: Exciting play-list where only track 10 Cooldown was from the current release (64). Ivar: The BodyCombat class seems like a solid crew where many of the participants know each other. Playlist: Yet another good and energetic playlist, and since we were last class of the night, we were treated with a bonus track-7. 53-1ab. 1a: Written In The Stars/Are You Ready For This, 61-2 Shot Me Down, 45-3 Because the Night, 36-4 Zombie, 56-5 Stamp On the Ground, 50-6 Gimme Dat, 64-7 La Nina Mechanica, 62-7 Let the Beat Go, 44-8 Your Shining, , 64-9 Shell Shocked, 64-10 Simply Amazing. Ivar: Come on! With “Shot Me Down”, “Stamp On the Ground” AND both “La Nina Mechanica” and “Let the Beat Go” this could only turn out to be an excellent evening. 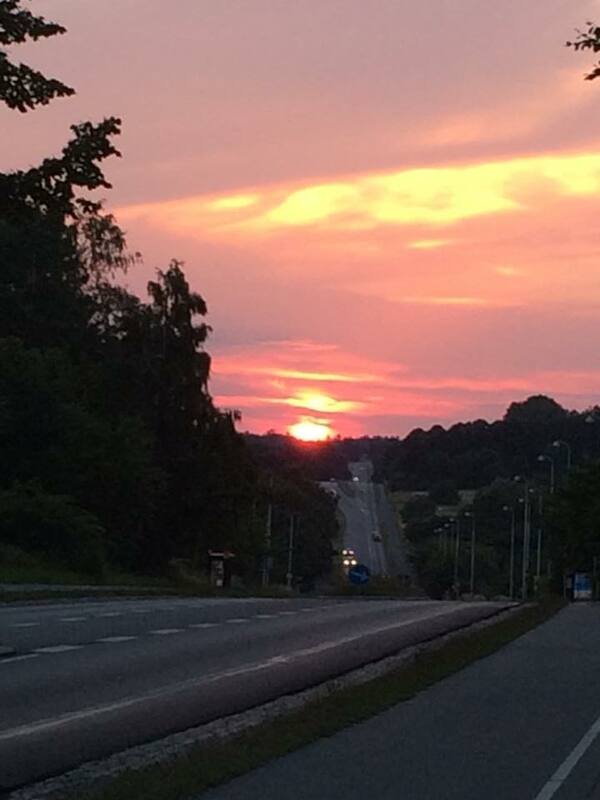 Pernille captured this amazing image on the way home from the class; I think most of us felt it was the perfect finish to a really good evening. Review of center: My first visit at Field’s fitness.dk. On the top floor and in one level. Lockers use cards. Button operated showers with temperature regulation. There was a really good atmosphere in the Combat Class. Everyone was chatting among themselves right until class start. Playlist: Good playlist with many oldies but goodies and possible one I had not tried before (Firestarter). Playlist: It’s interesting that both “The Phoenix” and “Your Shining”, which after all are 2 and 5 years old respectively, at the moment are so frequently used by different instructors. 64-1ab Freaks/Can’t You See, 58-2 Strobelight, 64-3 You’ve Got The Love, 57-4 The Phoenix, 64-5 Hot Right Now, 64-6 Black Widow, 64-7 La Nina Mechanica, 44-8 Your Shining, 64-9 Shell Shocked, 64-10 Simply Amazing. Ivar: A little lacklustre contribution from me this time around, not good enough. Playlist: Great reunion with the Shine On track from 53. 64-1ab Freaks/Can’t You See, 45-2 Back to Innocense, 53-3 Shine On, 48-4 Come In Hard, 64-5 Hot Right Now, 64-6 Black Widow, 53-7 Blade, 45-8 See the Light, 64-9 Shell Shocked, 64-10 Simply Amazing. Ivar: It was a good class, with great energy. Playlist: Tina had a treat in store with a Rammstein in the cool-down, however, the tour didn’t make it to Birkerød, so only the not-quite-as-crazy Birkerød ninja were able to enjoy the great playlist. Playlist: I have to start of with a confession. Andy had a few really old tracks that I couldn’t immediately identify, and as I was out in town right after the class, I did not have time to check my archives, so there are a few holes in the playlist this time around. Karin: Emergency! Someone call 911! Review of center: Amager Strand is a new center. It’s not particular large, but appears smart. Remember a padlock for the lockers. The stuido is very spacious and with great natural light from large windows. Without the class appearing clique, there seemed to be a small core group of regular Combatters. Playlist: A good playlist with a fine mix of relatively new and real classics. 62-1ab Someone Like You/Home Alone, 49-2 Kick In the Teeth, 52-3 When I Close My Eyes, 25-4 Jigga Jigga, 59-5 Bright Like the Sun, 59-6 Danger Zone, 64-7 La Nina Mechanica, 44-8 Your Shining, 64-9 Shell Shocked, 64-10 Simply Amazing. Ivar: I am really enjoying seeing new centers, meeting new classes and experiencing different instructors. 64-1ab Freaks/Can’t You See, 49-2 Kick In the Teeth, 53-3 Shine On, 48-4 Come In Hard, 64-5 Hot Right Now, 64-6 Black Widow, 53-7 Blade, 63-8 Shine, 62-9 3 Kingz, 62-10 I Was Here. Ivar: Well, it was certainly hard. I have sore legs and a beginning inflammation of my left elbow, but it has been worth it. It has been great fun and very inspiring to see the different gyms, meet the different classes and experience the variation of styles among the instructors. Jackie: It will be great getting our normal “3 training passes a week” life back.